The Solar System. / Theory of the Seasons. 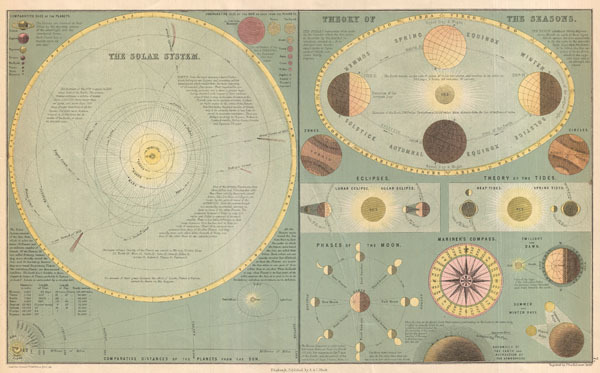 This is Adam and Charles Black's 1873 chart of the Solar System and the Theory of the Seasons. The Black brothers introduced this map in the 1850s and it went through a series of revisions and editions well into the 1880s. This example, from 1873, is one of the first editions of this map to make use of chromolithographic printing techniques - previous editions were black and white. The left hand side of the chart shows the Solar System with extensive explanatory text. The right hand side of the map offers a number of charts showing how the rotation of the earth around the sun affects the seasons. Also offers charts on the tides, eclipses, the phases of the moon, summer and winder, the atmosphere, and a mariners Compass. Engraved by J. Bartholomew and printed by W. H. M Earlane, both of Edinburgh, for the publishing firm of Adam and Charles Black. Issued as plate no. 7 in the 1873 edition of Black's General Atlas of the World. Black A. and C., General Atlas Of The World, 1873. Good. A couple of minor creases and margin reaparis. Else clean.